Lap of Love is a nationwide pet hospice that provides in-home care for pets. CINCINNATI — When most people think about becoming a veterinarian, they might envision handling kittens and puppies. For Dr. Jennifer Roedig, the saddest moments are just as rewarding. “I just don’t get that sad, and it’s not that it doesn’t make me sad — I just know that I’m doing the best thing for the pet,” Roedig said. Roedig is the only full-time veterinarian with the Cincinnati chapter of Lap of Love. The nationwide network of doctors, which started 10 years ago in Tampa, Florida, focuses on geriatric pet care. The goal is to provide in-home end-of-life care and to help families know when it’s the right time to say goodbye. Watch the video above for more about Lap of Love's services. It has served patients in Cincinnati and Northern Kentucky since 2015. “With hospice care, we take the focus from curing to comfort, so we manage pain, anxiety and look around the home to see if there are other changes we can make to help them navigate better,” said Roedig. Dr. Jennifer Roedig is the only full-time veterinarian for Lap of Love in Cincinnati. More than 68 percent of households own pets in the United States — roughly 84.6 million homes — according to the 2017-2018 survey conducted by the American Pet Products Association . The survey also projects that Americans will spend an estimated $75.38 billion on their pets in 2019, including food, supplies and vet visits. Although pet ownership is common and most owners are willing to spend money for their care, knowing what to do with an older pet can seem overwhelming for many. Roedig experienced this herself in December 2017, when her 13-year-old lab mix was exhibiting major health issues. Her grandfather had died two days earlier, and she didn’t want to risk a crisis situation with her dog. She remembered hearing about Lap of Love during a conference in veterinary school, so she reached out. “He knew how loved he was," Roedig said. "He got to sit in my mom’s lap, and I got to hold his head in my hands as he gently went to sleep, and I couldn’t have asked for a better experience for him." It was an experience that forever shaped Roedig's career. "It is the most heartbreaking, difficult decision you’ll ever have to face as a pet owner, but I know that I’m helping these families, I’m helping these pets," she said. "I’m buying them time if I can. I’m making sure the pet is more comfortable, enjoying life." 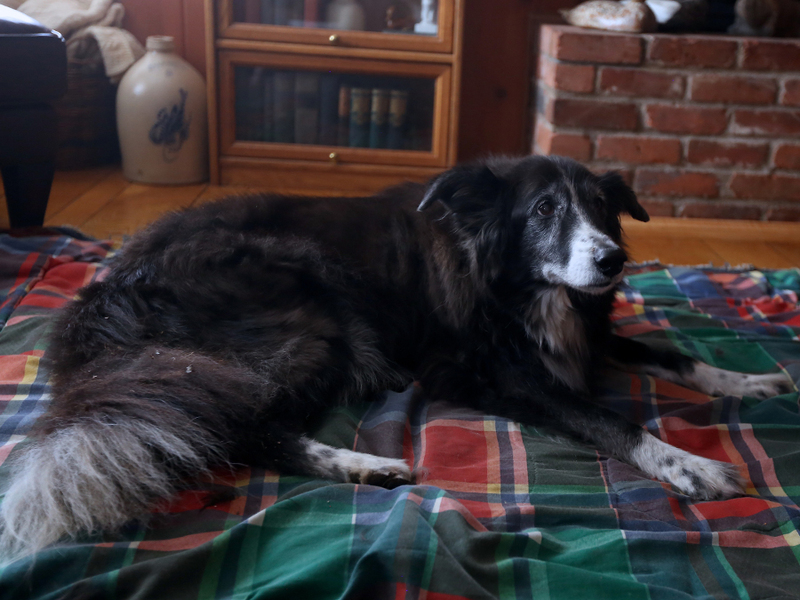 When Sue Weakley of Terrace Park discovered her 16-year-old dog had cancer, she knew she didn’t want her last memory to be at a vet’s office. Sue Weakley walks her dog Divot every day, but lately the walks are much shorter due to her dog's health issues. “She hates the vet. She’s a real homebody and doesn’t like to go places,” Weakley said. Divot, a border collie-mix, was rescued as a puppy. Weakley’s husband, Bill, an avid golfer, gave her the name — one appropriate for a puppy who loved to dig holes in the family's yard. A few months ago, Divot was diagnosed with soft tissue sarcoma and had a large tumor removed from her leg. She's also deaf and suffers from arthritis. Today, she's not able to walk for long distances like she used to. Going just a few blocks can take up to 40 minutes. “This is really silly, people think I’m crazy, but I sleep in the den with her now because she can’t go up the stairs,” Weakley said. It's not a hassle for Weakley. She sees Divot as more than just a pet. Divot was instrumental in helping Weakley cope with her husband's sudden death four years ago. Following a river cruise in Europe, Bill contracted influenza, which rapidly developed into pneumonia and then pulmonary fibrosis. He spent several months in the hospital. Dr. Jennifer Roedig first met with Divot for an assessment in February. “He never really got to come back home,” Weakley said. When the time came for Bill to enter hospice, Divot would join Weakley on visits. “She wasn’t trained to be a therapy dog, but she was like one," Weakley said. "And if I didn’t bring her, everybody was asking where she was." Bill was able to spend his last week of life at home. “He wanted his own bed, his own yard, and he wanted to be with Divot, too," Weakley said. Since Bill’s death, Divot has remained by Weakley’s side. She refers to the dog as her best friend. When Divot’s health began to decline, Weakley knew she wanted her dog to spend her final days at home, like her husband. A neighbor suggested she contact Lap of Love. Roedig had her first visit with Divot in late February. “I could see that she did have some mobility issues, some difficulty walking," Roedig said. "She was snoozing for quite a bit of it, but she appeared very comfortable while she was resting. And I feel that, based on talking to her mom about her quality of life, that she’s at a really good place." Since being on new pain medications, Divot spends more time sleeping. Roedig prescribed pain management medications, which Divot has been taking for several weeks. Weakley says she's noticed a difference. Divot sleeps more these days, but isn't in as much pain on walks. Weakley knows every day with Divot is a gift at this point, but she’s relieved to know she'll have support when the time comes to euthanize. “I don’t know if prepared is the right word, but I’ll feel more comforted knowing that she’s been cared for and her end will be here at home," she said. "I don’t have to worry about taking her somewhere or knowing when's the right time. I think they’ll help me realize when the right time is." Unfortunately, pet owners are sometimes confronted with that decision without time to prepare. Last year, Westwood resident Hilly Kenkel learned her cat had an aggressive cancer and only a few weeks to live. Bessie, a calico American shorthair, was a former stray Kenkel took care of for nearly 13 years and her first pet as an adult. The thought of putting her cat to sleep on a cold metal table made her cringe. She started searching for other options, until a friend recommended Lap of Love. "When I first called them, my voice was shaking, and they were so nice," Kenkel said. "I expressed to them that this was really important to me and that I wanted to do this soon but also not too late. It was a hard decision to make." Dr. Jennifer Roedig says Divot could have up to a year left, but that could change depending on if her cancer spreads. Four days after making the initial call, Kenkel called Roedig to tell her it was time. "There was a lot of crying. She let me take all the time I needed and I got to have an experience where Bessie was on my lap," Kenkel said. "It took me a long time to process. A full year later, I finally have some clarity that this was an awesome thing to do for her." Roedig knows these decisions are difficult to make. She says pet owners often tell her their dogs and cats are like their children. Despite being surrounded by death every day, she says it's an honor to help owners during those final moments. "Taking away the guilt a lot of families feel, affirming they’re making the best decision for their pet and letting them know it’s the best thing for them," Roedig said. "It’s not too soon, or too late. It’s the best day for them." Emily Maxwell is the visual journalist for WCPO's enterprise team. She specializes in longform digital storytelling and documentary video. Follow her on Twitter @EmilyWCPO or Instagram @emaxphoto .